Met Éireann is forecasting polar cold weather with wintry showers that could bring snow to places and cold frosty nights through to the weekend. After a week of sunny spring weather with temperatures in the high teens, Met Éireann's forecast is for winter conditions. The forecaster's national outlook is for conditions that will turn rather cold and showery with the risk of wintry showers. Temperatures will dip to freezing at nights right through to the end of the weekend. In her weather forecast after the RTÉ news meteorologist Michelle Dillon said there would be snow. 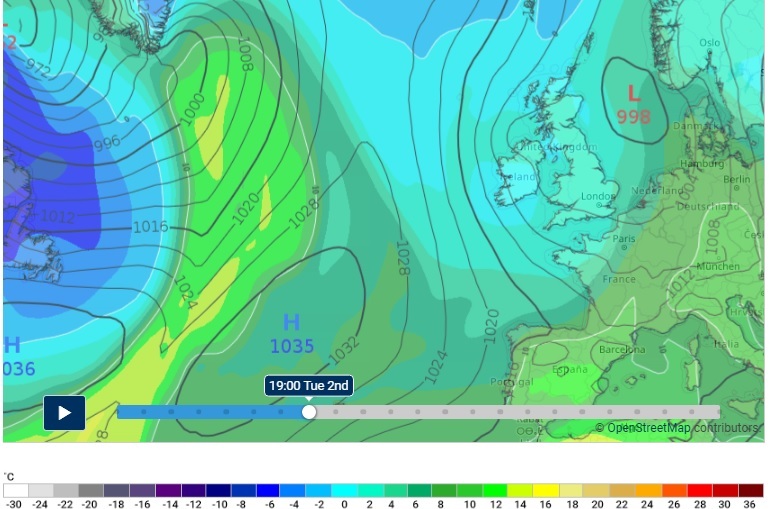 "It is going to turn cold and showery this week, some of those heavy and some wintry especially on Tuesday over the higher ground...we will have some frost and ice also by night," she said. She said the cold weather would bring persistent rain later on Monday which would be followed by a much colder airmass for the rest of the week. "We will have polar maritime air down across the country. Some of the showers will be of hail, sleet and even snow over higher ground over northern parts," she said. Met Éireann says Monday will bring a mix of cloud and brighter spells, with scattered heavy showers, the focus of these across Ulster and Leinster. Towards evening, outbreaks of rain will move into Atlantic counties. Highest temperatures will range 8 to 13 degrees Celsius, coolest across the north and northwest. Westerly breezes will be mostly moderate in strength, but fresher up along the Atlantic coastline. Monday night will be cloudy at first with showery rain clearing eastwards to scattered showers and good clear spells and later there is the risk of showers turning wintry. It will be cold with lowest temperatures of zero to +3 degrees and a widespread frost. Moderate winds will be west to northwesterly. 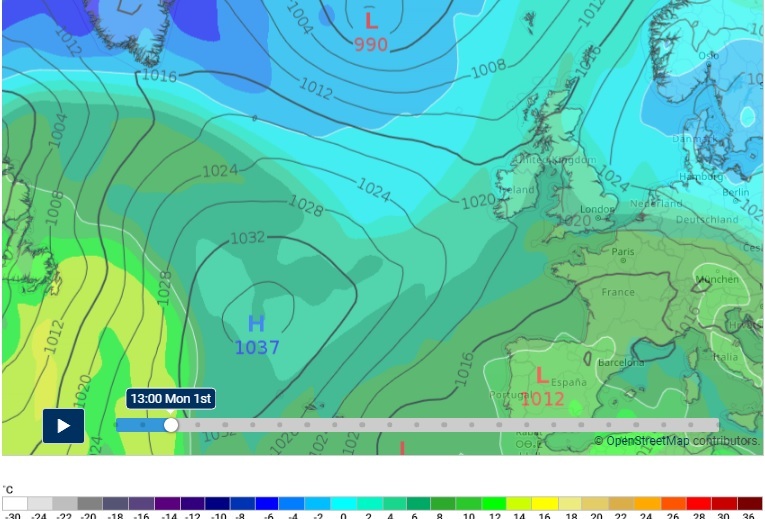 The forecaster says Tuesday will be a cold and blustery day with widespread heavy showers and the risk of hail and thunder. Some showers will turn wintry, especially over higher ground. Top temperatures will reach just 6 to 8 degrees. West to northwest winds will be moderate to fresh and gusty, but fresh to strong along Atlantic coasts. Tuesday night scattered showers will continue with the risk of turning wintry. It will be another cold night with lowest temperatures falling to around zero to +3 degrees with frost, especially over the eastern half of the country. Northwesterly winds will turn northerly and strengthen. Wednesday will continue cold with sunny spells and scattered heavy showers and the risk of hail and showers turning wintry, especially in the east but showers will ease later over the western half of the country. Top temperatures will be again just 6 to 8 degrees in fresh and gusty northerly winds. Wednesday night showers will become isolated and northerly winds ease. There will be good clear spells and it will turn cold and frosty with lowest temperatures falling to around -1 to +1 degrees but cloud will increase in the west towards morning. Thursday will see some showers with sunny spells but the cloud is likely to increase in the west and north with spells of showery rain there. Continue cold with top temperatures of 6 to 8 degrees in just light northerly breezes. Thursday night showers will become confined to Atlantic coastal counties. It will be cold and frosty again with lowest temperatures of -1 to +1 degrees in the light variable or calm winds. 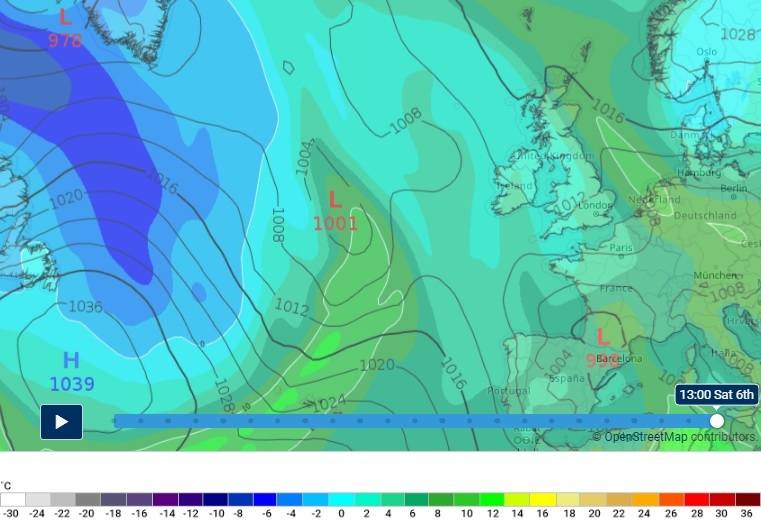 Met Éireann's weather charges show zero temperatures to the weekend.